Eric Heffer was the Labour Party member of parliament for Liverpool Walton between 1964 and '91. If there is one enduring image of Eric Heffer, it is without a doubt the moment he stormed off the stage at the 1985 Labour Party conference. That act of defiance was an illustration of the man: a fierce, independently-minded individual, unafraid to take a stand. Forged by the ethical Christianity of his youth and the socialist ideas of his adulthood, Eric was a man of commitment. A working class intellectual and devourer of books, a worker by hand and by brain, he was one of the most fascinating politicians of the twentieth century. Eric Heffer was born on the 12th January 1922 in Hertford, a large village of 12,000 people. His father was a shoe repairer and bookmaker who had fought in the First World War, while his mother worked as a scullery maid, kitchen maid and a cook before she married. In his youth, Eric was a choirboy, but left-wing politics were also present in the Heffer household. His mother was a member of the Co-operative Women’s Guild, while his brother read the Daily Worker. It was for this reason that Eric later wrote of himself that he was born not only into the working class, but into a movement. 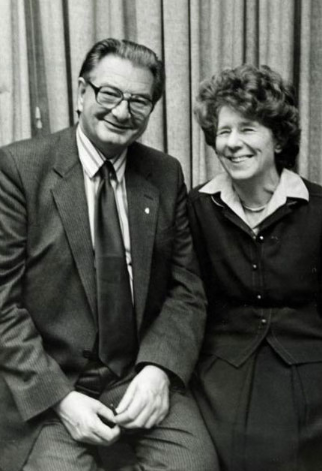 Eric Heffer with his wife, political secretary and lifelong collaborator Doris. After beginning work as a carpenter, Eric joined his first union – the Amalgamated Society of Woodworkers – at the age of 16, and joined the Labour Party at the same time. However, the rise of fascism in Germany, Italy and Spain – and a National Government in Britain seen to be appeasing these forces – radicalised him. Labour’s response to these events were slow and unsatisfactory to many young people. Stafford Cripps, a leader of the Labour left throughout the thirties and founder of Tribune, had been driven out of the party, and even Nye Bevan was briefly expelled. In the thirties, an era of endemic poverty, widespread unemployment, rising fascism, and a trade union movement that had been decisively weakened by the defeat of the 1926 general strike, the Labour establishment’s harassment of its socialist wing felt alienating to many people seeking out answers to a world dominated by poverty, exploitation and war. In this era, the Communist movement appeared to offer something tangible and positive. It was in this context that Eric joined the Communist Party of Great Britain (CPGB) as a 17-year-old. When war broke out, Eric was called up into the Royal Air Force. He did not have enough qualifications to become a pilot, joining the RAF’s ground crew instead, where he repaired and reconstructed aircraft. After a period in Cardington, he was sent to Liverpool with a maintenance unit; it was here, above a Communist bookshop in Fazakerley, that he met his future wife, Doris. After a frenzy of letters between each other, the two married as soon as Eric was demobbed in December 1945. Though Eric and Doris initially moved into his family house in Hereford, they decided to return to Liverpool, where Eric threw himself into trade union activity. By this time, he was seen as a dissident within the CPGB because he was prepared to be critical of the Communist leadership both in London and Moscow. At this time, Eric began to study the ideas of Rosa Luxemburg. As an opponent of revolutionary elitists who believed that workers could not achieve things for themselves but needed a disciplined party that would impose on them what was good for them, Luxemburg stood out for Eric as “all that was good in the labour movement”. Of course, independent thought can bring you into conflict with organisations that subscribe to rigid orthodoxies. In 1947, Eric was finally summoned to the CPGB’s London offices and accused of organising factions. After nearly a decade in the Party, he was expelled; he went home and cried. When he and Doris attended a Daily Worker fundraising dance at St. George’s Hall, they were ignored by their former comrades, and Doris was also told that her own membership would not be renewed. After his sojourn into the world of Communism, Eric finally rejoined the Labour Party in the Arundel ward of Toxteth, becoming a delegate to Liverpool Trades Council. In those days, each meeting of the Trades Council was packed. The executive committee included Jack and Bessie Braddock – the latter being the MP for Liverpool Exchange from 1945 to 1970, and both fellow ex-Communists who left for Labour. 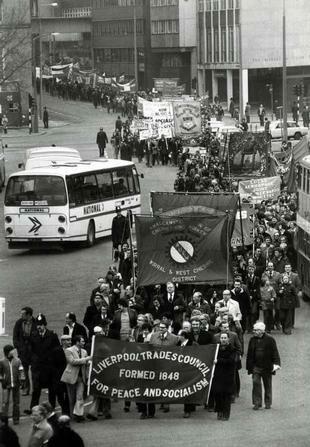 Eric Heffer leads a march through Liverpool to Pier Head in the late 1970s. Over the next decade, Heffer contributed to opening up a left-wing intellectual sphere within Labour. He was already friendly with Ted Grant, who later became significant in what became known as the Militant Tendency. After the suppression of revolts in east Berlin and Hungary led to an intellectual revival on the left, Eric was in close correspondence with New Left luminaries such as E.P Thompson, confidently articulating his own ideas of workers’ self-management and internationalism to those who wished to hold on to socialist politics without the baggage of defending authoritarianism. In 1958, he was elected chair of Toxteth Constituency Labour Party (CLP), and was vital to the rise of the Campaign for Nuclear Disarmament (CND) in Merseyside. Two years later, he won the Pirrie ward in Walton from the Tories by just fifteen votes. By 1963, he was selected as Labour’s candidate for Walton. Following Labour’s general election victory of 1964, Heffer took the seat of Walton from the incumbent Tory candidate, Kenneth Thompson, by 2,906 votes. Walton, which had once been a swing seat, is now a Labour stronghold due to Eric’s provocation, dedication and commitment to challenging assumptions. It was the battle for a truly socialist Labour Party – and the battle against reactionary forces within the party – that would come to define him. 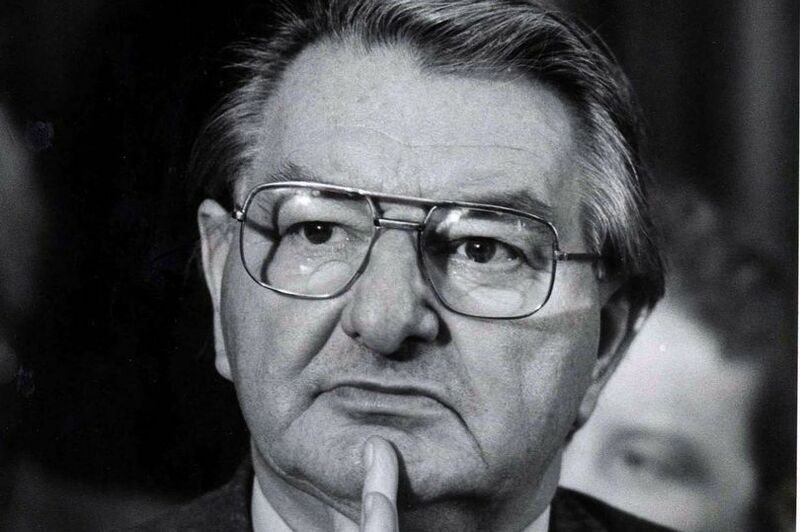 Following his consistent disappointment with the aspirations of Labour governments throughout the sixties and seventies, Eric was a consistent fighter for socialist objectives in Labour’s parliamentary party. 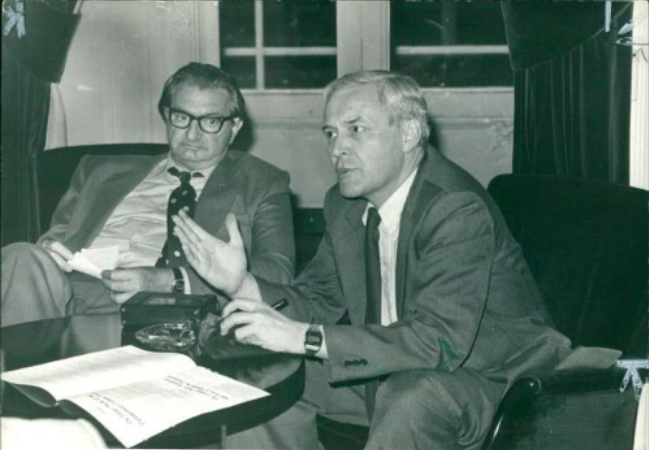 Eric Heffer with his longtime ally Tony Benn, with whom he served in the Department of Industry. In the 1974 Labour government, Harold Wilson gave Eric the role of Minister of State at the Department of Industry, under his lifelong friend Tony Benn. With Benn, he developed a white paper which became the Industrial Bill – a transformative document that sought to allow for large-scale investment in industry, and to also give a Labour government the right to take failing firms into public ownership. However, he later organised his own sacking from the frontbench to state his opposition to the European Economic Community (EEC); Benn was also demoted from his role, and the bill was significantly diluted. In reality, they wanted to mould the party in the shape of mainland European social democracies, explicitly eschewing socialism, and formed the SDP, which they perceived to be a “middle position” between the “extremes” of Thatcherism and Labour. A total of 28 Labour MPs defected to the new party. While the war of attrition was fought outside the colliery gates, another battle was being fought closer to home. While Britain swung 3.9% away from Labour in the 1983 general election, Liverpool swung 2.4% towards the party in the coinciding council elections. There were no Tory MPs left in the city. Faced with huge cuts, Liverpool Labour had taken inspiration from the Poplar Council in east London, led by George Lansbury, which proudly said it would ‘break the law rather than break the poor.’ Labour built 2,600 houses, created jobs, new parks and sports centres. 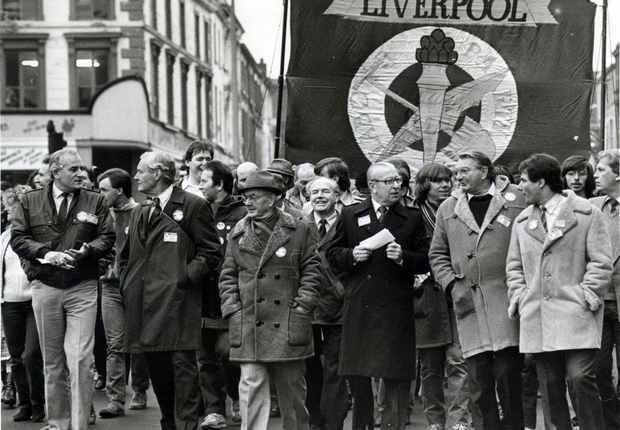 Eric Heffer marching with Liverpool Labour members and city councillors during the 1980s disputes. Years later, Heffer said that “one might have thought” that those opposing the Tories in Liverpool could have expected the weight of the labour movement to support them against Thatcher. “The reality”, he sadly reflected, “was somewhat different.” At the 1985 Labour conference, Heffer stormed off-stage in protest at Kinnock’s aggressive attacks on Liverpool’s Labour council. He learned later that Doris did too, storming out of the hall even faster than Eric. Eric was clear in his mind that Kinnock’s speech was a green light to those on the right to carry out a purge of left-wing members. However, Eric’s health was rapidly deteriorating. When Parliament was recalled to debate the invasion of Kuwait in September 1990, Heffer – visibly ill – used what he knew would be his last speech in the House of Commons to urge the United Kingdom not to go to war. A few months later, he returned to Parliament in a wheelchair to vote against the Gulf War. He died in May 1991, at the age of 69. It couldn’t be clearer that at this pivotal moment for the labour movement, there are few more relevant figures to guide our path than the Eric Heffer. His lifetime’s pursuit of democratic socialism within the Labour Party is something I believe we are closer than ever to achieving under the leadership of Jeremy Corbyn. The party, our members and its leadership must remember that our duty is to secure a Labour government in order to lift our people up and transform our economy and our society. Eric was sacked from the cabinet for his opposition to the EEC, but he never lost his sense of priorities. He would later write “I believe we should work for socialist and working-class internationalism in Europe without making the EEC a major issue of contention.” With that, let’s remember socialism is the language of priorities. Eric also believed a truly democratic socialist Labour government must eliminate class society. He believed the socialist case for public ownership, as set out in the old Clause IV of Labour’s constitution, was not only related to efficiency, but was essential to eliminating class divisions and privilege. But neither did he want the state to be all pervading; as a longstanding advocate of workers’ self-management, Heffer envisaged many and varying forms of public ownership that would eliminate the power and influence of the capitalist class, and put workplaces under democratic control. Today’s Labour frontbench is committed to this vision, and I want us to secure these achievements of the last few years for the future. I want us to secure these achievements of the last few years for the future and those debates, about our party’s constitution, are thriving amongst our party members and trade unionists. Contrary to what we are told – that party divisions can only damage our standing with the public – I believe that socialists winning the battle of ideas within the Labour Party is the only route to winning a democratic socialist government that can gain the popular support of the people. Our party and our movement need representatives like Eric: totally uncompromising figures, unafraid to upset the Westminster consensus or ruffle feathers in the corridors of power. As Eric’s successor in Liverpool Walton, I see my own role in very simple terms. I am a representative of my class in parliament, a voice for organised labour. My duty is to fight for a socialist Labour government – a goal which is the only way to transform the lives of my constituents, who are suffering under a rampant capitalism that inflicts inequality and poverty on the most vulnerable. I’m proud to walk in Eric’s footsteps today and represent this proud working class community which, at the last election, recorded an 85.7% vote for Labour. During his time in parliament, Eric fought the Conservative agenda of inflicting an undignified livelihood on working class communities. He opposed war, resigned from positions of power on principle, and maintained an internationalist vision of world affairs. His legacy, which we must not forget, was to believe that the socialist transformation of Britain was not only possible – but urgent. This article was adapted from the Eric Heffer memorial lecture delivered by Dan Carden MP.